Many people in the western world have never heard of natural Organic Neem Products. But Neem is nothing new to the natives of India and Southeast Asia where the medicinal properties of the Neem tree have been utilized as far back as 4000 B.C. The timeless traditions of these natural herbal remedies continue to be passed from generation to generation. Supported by centuries of use, and modern science, the uses of Organic Need Products are many. Hundreds of studies in universities and laboratories around the world have documented their efficacy for helping to treat numerous diverse disorders. Neem that is grown natural and completely free from pesticides, are what makes organic Neem products a healthy nontoxic alternative. This page is to introduce you to a few of our most beneficial organic neem products for your health and personal care, as well as for your gardening and pet care needs. 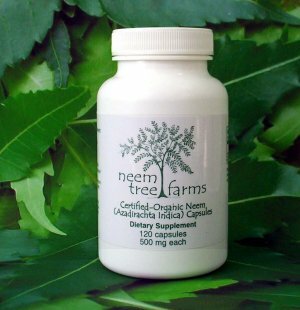 You may click on any product image to learn more information about any organic Neem product and how you can purchase Neem from Neem Tree Farms. Please feel free to browse and learn more about these organic Neem health care, personal care, pet care and garden care products. 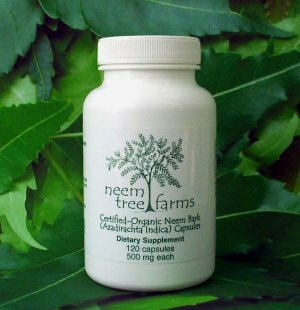 If you have never used Organic Neem products before, try this Neem product sampler! If I can answer any questions for you about any organic Neem product, please contact me by using the form at the bottom of the page. 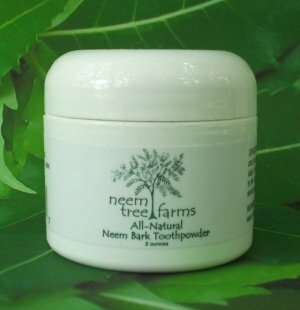 The ingredients that made organic neem products an important part of the Ayurvedic tradition for more than 6,000 years are concentrated in the Neem Bark, which is specifically cited for treating gum disease, as a potent antibacterial and anti-inflammatory agent, and for its strong stimulation of the immune system. Ingredients: Powdered neem bark, hydroxpropyl methyl cellulose in a Kosher-certified, preservative-free vegetarian capsule that contains no starch, sugar, corn, soy, wheat or dairy products. Recommended Use: Take 1 to 3 capsules once or twice a day. Not recommended for use by pregnant or nursing mothers, or anyone (male or female) who is trying to conceive a child. BEST BUY: Buy 6 bottles for the special price of $64.99. Buy a bag of 1,000 to refill your bottle for only $69.99! The organic Neem leaf has been known to help reduce high blood pressure and cholesterol. Neem leaf has also helped in reducing arthritic pain and discomfort, psoriasis, and eczema. Our finest, shipped to Florida by air express for encapsulation in veggie caps that contain no animal byproducts. Without doubt, these capsules are the best possible value for discerning customers who demand exceptional quality in their medicinal herbs. Ingredients: neem leaf, hydroxpropyl methyl cellulose in a Kosher-certified, preservative-free vegetarian capsule that contains no starch, sugar, corn, soy, wheat or dairy products. Not recommended for use by pregnant or nursing women or anyone (male or female) trying to conceive a child. OUR BEST OFFER: Buy 6 bottles for the special price of $64.99. Buy a bag of 1,000 to refill your bottle and pay only $69.99! As far back as 4000 B.C., ancient healers recognized the many qualities of the neem tree. Along with its natural anti-oxidant and anti-bacterial properties, Neem repellent has been used for thousands of years to keep insects away. In ancient India, infants were bathed in water boiled with neem leaves and when mothers left babies unattended, they often left a small neem branch nearby for protection. Modern science has validated that ancient knowledge with multiple studies indicating that neem may be an effective nontoxic alternative to products containing DEET. 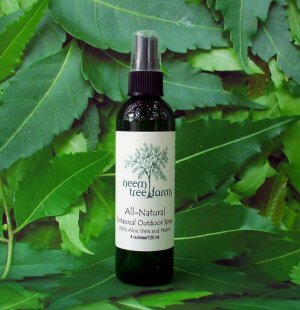 I recommend Neem Tree Farms Botanical Outdoor spray because it contains only natural ingredients. It goes on quickly making it easy to use to keep those bugs away while it soothes the bites you already have. It is scented with essential oils of lemongrass, cedar and lavender with the additional boost of karanja oil, traditionally used to create a synergy with Neem. INGREDIENTS: Distilled water, cold-pressed Neem oil, essential oils of lavender, cedarwood and lemongrass and natural emulsifier made with plant products. People are not the only ones who benefit from the wonders of Neem. Today's pet owners are concerned about the toxic chemicals found in most commonly sold pet care products. They are looking for natural pet health alternatives to keep their four legged friends healthy and pest free. Organic Neem oil can be added to pet shampoo to kill ticks and fleas, or the area where the pets usually stay, can be treated with neem oil spray. Therapeutic Neem Oil Pet Shampoo will cleanse and soothe your pet’s skin. Great for hot spots, flea bites, dermatitis and all skin irritations. Its natural - its safe - it works. You will love how your pet’s coat will look shiny, feel soft & smell fresh after using Therapeutic Neem Oil Pet Shampoo! Neem Pet Shampoo has been specially formulated to gently clean your pets skin, with no toxic chemicals, soaps or waxy synthetics and is just one of our popular neem for pets products. 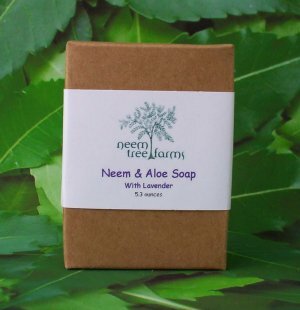 This natural Neem oil soap is great for sensitive, oily or acne-prone skin, combining the ancient healing properties of neem essential oils, with the aesthetics of a delicately hand-crafted soap. Mild, made from only the purest organic natural ingredients, and are non-drying. Full-sized (5 ounces or more) bars hand-made with organic neem leaf extract and coconut oil, stabilized with natural sea salt. Ingredients: Coconut oil, sodium hydroxide, organic fresh neem leaf extract, fresh organic aloe vera gel, cold-pressed neem oil, fragrance & seasalt. Try all six scented varieties for the special price of $15.99. 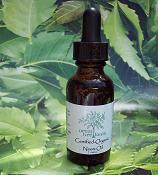 This Organic Neem product is an excellent moisturizing oil with historical and scientific validity as a medicinal. Neem oil is exceptionally rich and with a heavy scent. Neem oil should not be taken internally and should be kept out of child's reach. Athlete’s foot: Add a few drops to a foot soak, foot powder, or anti-fungal ointment. For dandruff and head lice: Massage a few drops along with some olive or other carrier oil into the hair and scalp. Leave in for one hour, and then shampoo out. In salves-- add a few drops or organic neem oil to your healing salve. Hand soap: Add to liquid hand soap for antibacterial properties. Acne-- mix a small amount of organic oil into your facial clay and apply to problem spots. Bath-- mix a few drops into the bathwater. Bug repellent: Use in lotion to deter bugs and mosquitoes. If you want to keep your organic garden free of pests, try using neem oil insecticide. Many people use neem oil pest control for garden as well as household bugs. Instructions: Simply mix 2 ounces of neem oil per one gallon of water and add 2 teaspoons of liquid dish detergent or Castille soap. The spray will suffocate soft bodied insects, and will repel other insects. Spray the mixture around the area were insects persist. Spray again every other day for a week. Maintain by spraying once a week. Note: These statements have not been evaluated by the EPA, which generally only recognize toxic chemicals as effective pesticides. Learn more about Neem Oil On This Page! Here is Where to buy Neem oil! The above information is not intended to take the place of professional medical advice. Neem products should not be taken internally by anyone who is pregnant or trying to conceive. They may contains compounds similar to those in aspirin and should not be used to treat children with fevers, or by people with known allergies to aspirin and aspirin like substances. Neem oil should never be taken internally.